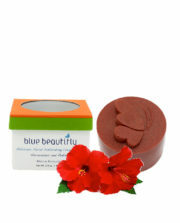 Argan Facial Exfoliating Cleansing Bar is a mineral-enriched facial skin perfection scrub. 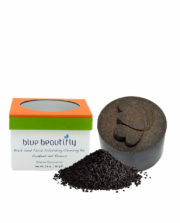 It gently scrubs the dead skin cells as it moisturizes and refines the skin. 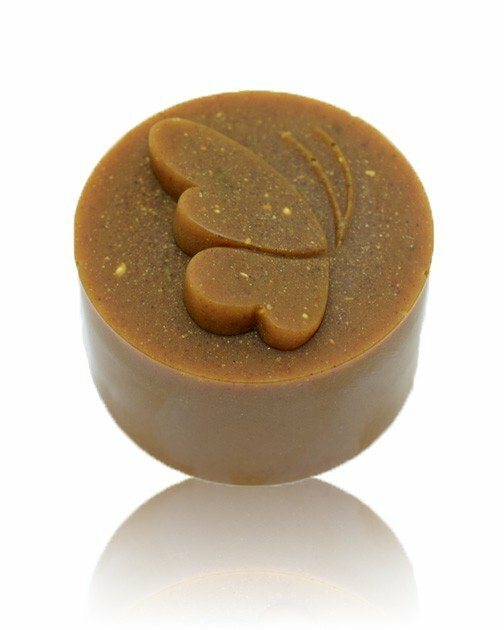 This all-natural cleansing bar offers light exfoliation as it purifies and cleanses the skin thoroughly in a non-drying manner. 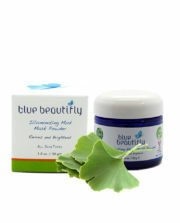 French Yellow Kaolin and Moroccan Rhassoul Clays deliver rich minerals to the skin. Calendula Flower, Turmeric, and Aloe Vera Leaf soothe, nourish, and renew the skin to reveal its natural youthful glow. Argan Oil and Shea Butter condition and rejuvenate the skin. Your skin will look supple and luminous. Reveal your skin’s natural sparkle and glow with Argan Facial Exfoliating Cleansing Bar! 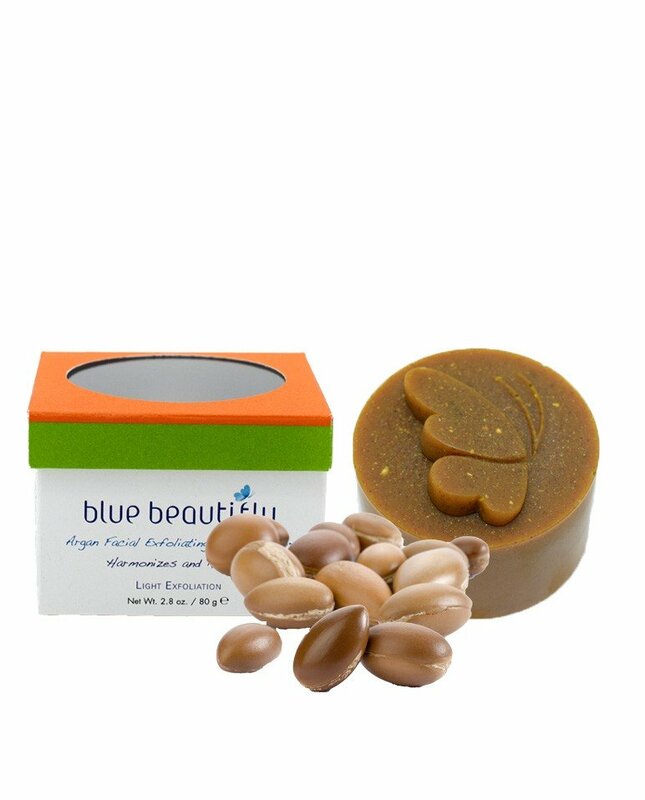 Blue Beautifly Facial Cleansing Exfoliating Bars are enriched with organic shea butter, potent herbs, precious oils, essential oils, and mineral-rich clays to exfoliate, renew, and nourish your skin, revealing your natural sparkle and glow. Organic Raw Aloe Vera Leaf. Known for its soothing qualities, it contains folic acid, copper, and Vitamins A, E, C, and B12. Organic Cold Pressed Argan Oil. Rejuvenates, improves elasticity, smoothes appearance of wrinkles. It nourishes scalp and hair. Organic Raw Calendula Flower. Also known as Marigold, it is known for its skin soothing properties. Earth Organic Raw Yellow Kaolin Clay. Naturally consisting of calcium, magnesium, iron, potassium, phosphorus, silicium, it lightly exfoliates, tones, gently draws out impurities, and nurtures the sensitive skin. Ingredients: Glycerin Soap*; Blended Essential Oils of: Grapefruit (Citrus Paradisi)*, Lavender (Lavandula Angustifolia)*, Palmarosa (Cymbopogon Martinii)*, Ylang Ylang (Cananga Odorata)*; Yellow Kaolin Clay (Kaolinite)‡, Aloe Vera (Aloe Barbadensis)*, Rhassoul Clay (Moroccan Lava)‡, Shea (Butyrospermum Parkii) Butter*, Argan (Argania Spinosa) Oil*, Calendula (Calendula Officinalis) Flower*, Turmeric (Curcuma Longa)*. Rub directly on your wet skin in circular motion. 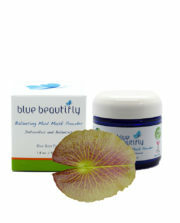 Best when followed with a facial massage using Blue Beautifly oil serums. Depending on your skin’s needs and condition, use once a week to once a day.